With a plethora of design platforms and seemingly inexhaustible number of pinboards dedicated to treehouses, there is no disputing that most of us are fascinated by them. Far from the simple makeshift structures we may have assembled as children, modern treehouses are architectural feats. From sleek organic shapes that appear to be suspended mid-air to quirky cottage-style hideaways and fairytale castles, modern treehouse design is testament to our rapidly-developing, collective skill in construction. 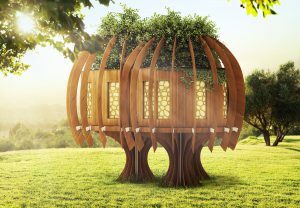 In addition to making wood work in innovative ways, the treehouse industry is also pioneering entirely new construction and design concepts, many of which help to set eco-friendly design precedents that go on to influence the building industry in general. The glamping market epitomises this trend towards alternative and environmentally considerate forms of accommodation, with its characteristic emphasis on visitor experience. 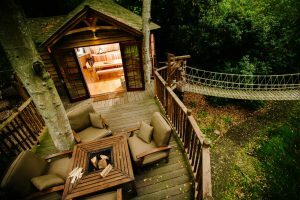 Tree houses built for the leisure industry, like those designed by Blue Forest for Center Parcs and Chewton Glen have helped to shape key principles in modern treehouse design, with their unique and unusual building shapes, curved walls and generous exterior decking, often tucked among existing undergrowth. But modern treehouses are not just impressive to behold from the outside. Because they are each designed with a very particular purpose in mind, a great deal of thought should also go into the interior design of a tree house. Much like interior design for brick-and-mortar residences, treehouse interiors take their lead both from their function and their setting. In the broadest sense a treehouse is a serene escape and a wonderful asset. But if you have one built you will usually do so with a very particular use in mind. This will influence how the interior is conceptualised. 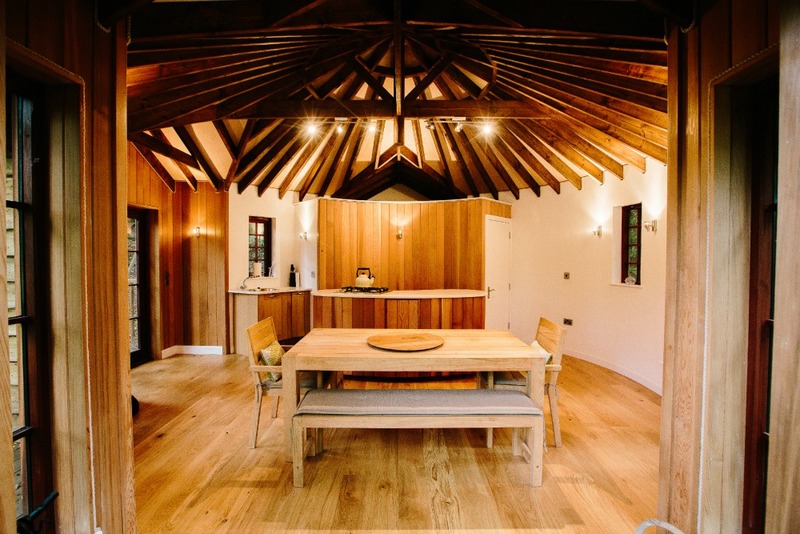 At Blue Forest we’ve designed and built everything from lodges to treehouse kitchens, music studios and children’s play dens. Before we start the design process, we ask that the client shares their vision not only for how the treehouse should look, but also how they want it to work for them and importantly, how the space should make them feel. Treehouses that will host social gatherings usually have larger communal areas and plenty of deck space whereas hideaways may have more separated spaces, sometimes even a series of individual treehouses connected by rope bridges. “How a treehouse is used will also change with the seasons. So keep in mind how your needs might change during winter. A central hearth could become a nice focal point for huddling around during winter,” explains Flo Holden-Parker, Blue Forest’s Interior Designer. Virtually all of the treehouses we design and build at Blue Forest represent a reconnection with nature. Each client will have their own particular idea about the tone in which this connection should be established, be it through clean, organic geometric shapes or rustic styles and natural finishes. To create continuity, it is essential that the tone set with the design of the interior, is reflected throughout the design and translates both in how the exterior looks and is evident in the atmosphere created in the interior. The windows of the Quiet Treehouse featured a “plant cell” pattern. This may be a case of echoing certain architectural elements or finishings used on the exterior, inside the treehouse. Windows and light are another key consideration. To borrow a rather tired cliche, if the windows are the eyes of a house, then they must be both the spyglass and wall hangings of a treehouse. A great deal of character and mood can be conveyed through the style of windows – from the choice of glass to the frame encasing it. Windows can be the difference between a charming cottage and a sleek modern escape. Well thought-out windows will both create a sense of space and seclusion, providing a view that simultaneously immerses you in nature yet somehow leaves you slightly suspended above it. With effective window design there won’t be much need to add any further dressing to the walls either. Because a treehouse is inherently a rekindling with nature, the interior should not create a discord between the outdoors and indoors. Heavy furniture, appliances and over cluttered spaces can often create a sense of over-civilisation. When it comes to furnishing, it may be better to start with only a few items and adding on as needed. Appliances are a different matter because considerable thought will need to be given to installing equipment like stoves, fireplaces and fridges and supplying these with the required sources of power. They can also be noisy. Choose the wrong kind of fridge and you may end up reintroducing precisely the noise you were looking to escape in the first place. If you are going to add appliances to your spaces and are concerned about noise, look for Quiet Mark approved technology that has been certified by the Noise Abatement Society. Cosy decks are great for summer evenings. But make sure you have snuggling-up space for winter. “Zoning” is a golden rule of interior design and one of the homemakers’ best allies. Your childhood tree house may have had one big (more likely quite cramped) central interior space. 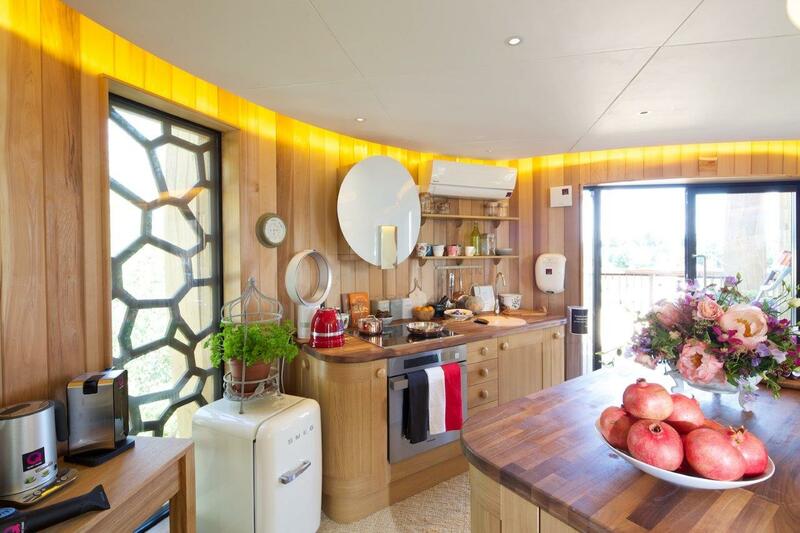 A bespoke treehouse on the other hand, is likely to have multiple rooms or spaces designated for different use. This again may change during the year according to the seasons and changing light. Once you’ve determined the zones for your treehouse and furnished accordingly, it’s a good idea to remain flexible on the use of your spaces. An area once fit for catching afternoon sun may no longer be quite suitable for winter months. “It is not unusual for clients to use their tree house differently depending on the season. In the summer a room may be opened up bringing the outside inside, whilst in the winter a more cosy environment may be required. Lighting the log burner and snuggling down in to a comfy chair,” explains Blue Forest’s Marc Storms, Architect RIBA. A treehouse straddles the line between the real and the imagined in a way no other building really does. Building a treehouse as an adult means simultaneously embracing the marvels and innovation of construction whilst being able to transcend above it. It is both a homage to the journey we’ve travelled from our carefree past and an affirmation of our continued capacity to dream. With so much symbolic value hanging in the balance, it is not enough for a treehouse to simply look spectacular. It needs to feel magical. And much like in the fairytales that sustained us when castles in the trees were the stuff of pure fiction, that comes from the inside as much as it does from without.